Fresh blackberry shortcake? Mmm, yes, please — especially with this easy shortcake recipe! Plump, juicy blackberries have been a part of our CSA share for the past few weeks. We’ve eaten a good bit of them straight out of the container or drizzled with vanilla yogurt, but I had a craving for some shortcakes smothered in blackberry sauce… and so this recipe was born. I know that firing up the oven in the middle of a heatwave is generally unappealing, but these homemade shortcakes are totally worth it. They’re sooooo much better than those spongey, tasteless pucks that grocery stores try to pass off as shortcakes. 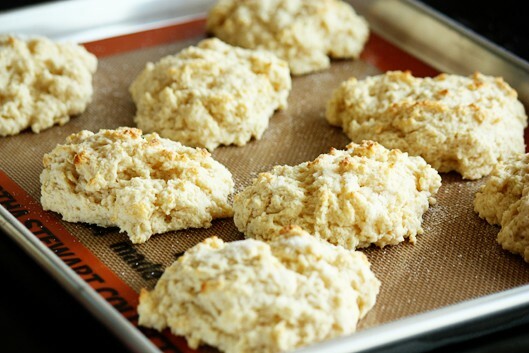 Added bonus — use my Bisquick substitute recipe as a starting point, and you can have them on the table in about 20 minutes! This chunky blackberry sauce is the perfect pairing for the warm, buttery shortcakes, and it’s super simple to make as well. 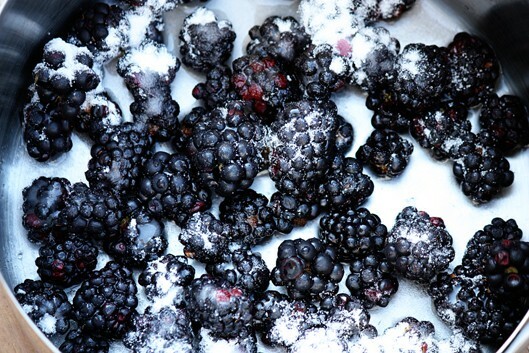 Toss your blackberries with some sugar and a little water and lemon juice for a delicious sauce. I wanted my sauce to be on the chunky side, so I reserved about a cup of blackberries to fold in at the end. Finally whip up some homemade whipped cream to top it all off! I left the vanilla out of the recipe in this instance because I wanted the clean taste of the freshly whipped cream to shine through. Mix together Bisquick mix, milk, sugar and butter. Sprinkle each shortcake with a little additional granulated sugar (optional). Bake at 425 degrees for approximately 15 minutes. Place 2 cups of fresh blackberries in a medium saucepan. Add sugar and water and cook covered until the berries release their juices. Mash the berries up with a fork and add lemon juice. 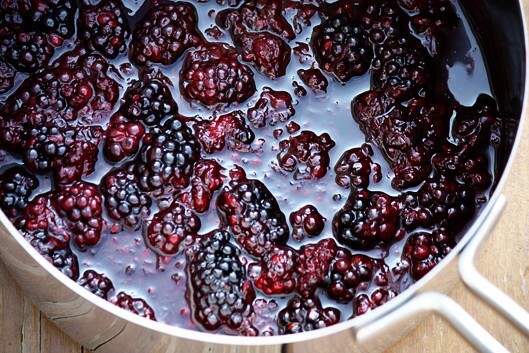 Fold in the remaining 1 cup of blackberries and heat until just warmed through. Split your shortcakes in half. Layer with chunky blackberry sauce and fresh homemade whipped cream. Judging by how quickly my kiddos gobbled these up, this recipe is a definite keeper and will be used with many different fruit toppings! 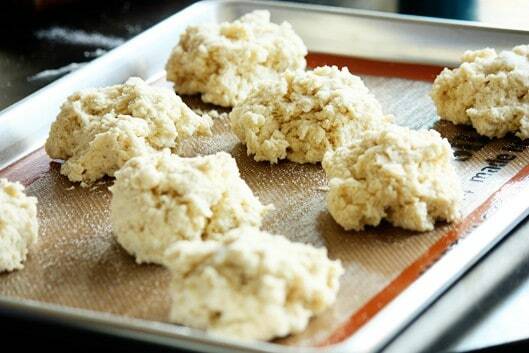 What’s your favorite way to top fresh shortcakes? could I use grated lemon? would that be any good you think? Hi Alexus! I think you’ll still want to use the lemon juice for the acidity, but adding a little fresh lemon zest would be wonderful. Don’t you just love love love SUMMER!!!!! I make this same recipe for quick shortcakes with sugar using Bisquick…great for cobbler as well as I am sure you know. I love shortcake and this looks really good and easy. Perfect for summertime. The blackberries are finally ripening here in the garden so I’m going to try this! Yummy! I have been on a blackberry kick lately (pies, jams, plain), so I am gonna have to give these a try! Looks great!